“Boil Jently” – A Nineteenth Century Gentleman’s Lip Salve. ‘The Knitter’ 122. ‘Hetty’ hap on cover is based on Lancashire squares. Well that was a surprise. 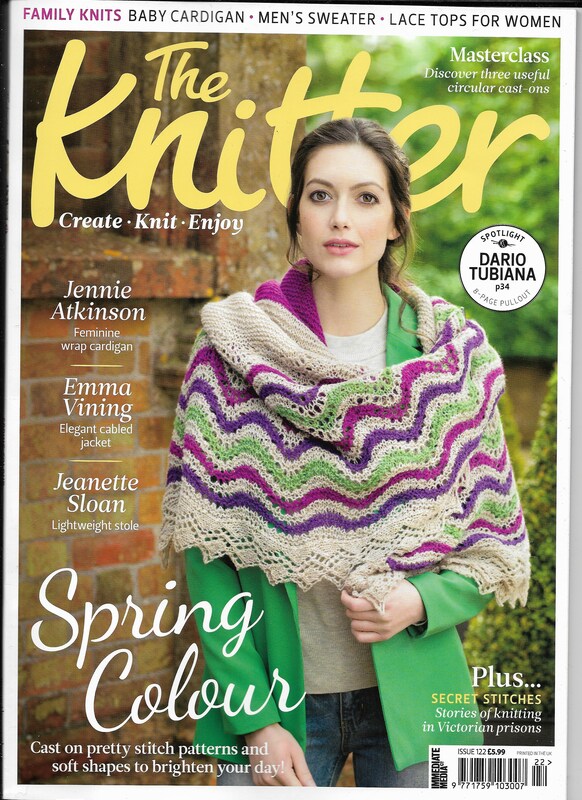 Just opened my complimentary copy of ‘The Knitter’ which has been languishing under a chair for a few days, to see if my history of prison knitting article is in – and my hap shawl is on the cover! I had no clue. I will write some more about it down the week as it has an usual structure based on an old Lancashire trick, the knitters here might enjoy. It was inspired by the colourful (woven) shawls of nineteenth century mill girls in Lancashire and Yorkshire. One other place you might need a practical, everyday, warm shawl in the nineteenth century was prison. I had already written and was about to hit send on the following blog post when I had my nice surprise. The piece is: ‘Secret Stitches: Stories of Knitting in Victorian Prisons’ which can also be found in ‘The Knitter’ 122. Check it out! It represents a tiny corner of the research I’ve been doing for a couple of years for my upcoming book, which will take us into… let’s say the more gothic side of knitting history. To accomplish this, I’ve been researching in the account books of York’s Debtors’ Prison, and, maybe unsurprisingly in the context, found some rather distractable debtors; who were supposed to be keeping accounts, but instead, wrote recipes and fascinating marginalia. The debtors’ Day Books, and other paperwork survive in very small quantities; it seems that when prisoners were admitted, someone impounded their paperwork; business and domestic account books, invoices, receipts, and court judgements – as defaulting on a court judgement was what got most in debtors’ prison. Only a few debtors’ accounts have survived, and luckily, from my period of interest; late Georgian – early Victorian dates. Considering the thousands of debtors who passed through York’s two debtors’ prisons in the 18thC and 19thC, only a small handful of York debtors’ records are extant. Debtors often knitted for extra income, items which they then sold at the quarterly Assizes when the prisons and courts were thronging with visitors. I’ve been working on this for my forthcoming book, and have scoured the debtors’ accounts for information about knitting. Found none, directly, although what I did find was still intriguing. One of ‘my’ knitting debtors, a York pub landlord, who ended up in the Debtors’ prison by 1841, wrote this intriguing recipe in his Day Book, in 1839. He was a man in his fifties, so this is probably a Georgian recipe. And don’t try this at home! I think the ‘marrow’ would be bone marrow from the leftovers in the pub kitchen, and ‘red bark’ may or may not be brazilwood – which could well be toxic. A small bit of Red Bark to colour it with, Boil jently, or simer it for 5 Minutes then strain it through a bit of Muslin, when nearly cold add a few drops of esence of Bergamot to scent it. For Hair oil despence with the Raisins and Sugar Candy and double the quantity of Marrow”. I will leave the red tinted lip gloss to the gentlemen of the 1800’s. Burt’s Bees makes some very nice tinted lip glosses, as well as clear one. Those are my preference. Me too! I do love the thought of these red-lipped, Bergamot-smelling dandies, though!